Painting eyes is critical to creating portraits with emotionality. Eyes show the focus of the subject and work in conjunction with facial muscles to create distinct and recognizable expressions such as fear, sorrow, and joy. Studying the anatomy of the eye is crucial even if you are producing a surreal or non-human model. 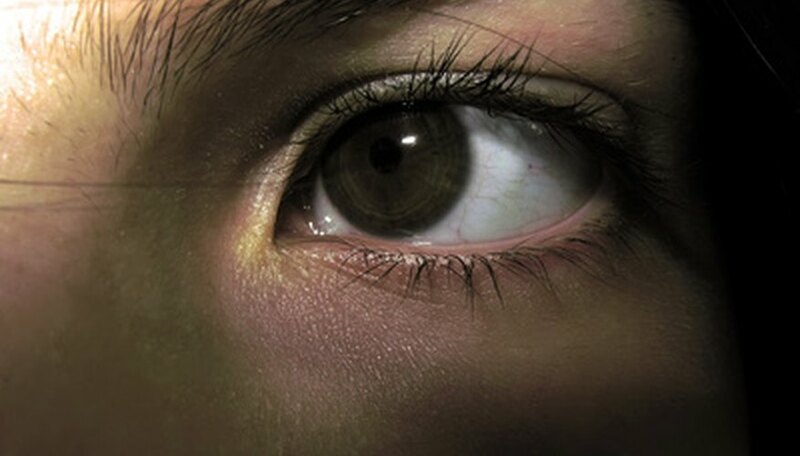 Conscious alteration or omission of the standard physiological features of the eye can add character to human or humanoid figures. Always practice painting eyes and faces on scrap canvas before approaching your final piece; this allows you to experiment with different expressions and colors. Draw two circles, eyeballs, one third down from the top of the face. Use a hard pencil with light pressure so that the lines are barely visible. Leave a space between the circles equal to the width of one to two eyeballs. Pencil a small circle, pupil, within the eyeball to indicate the direction of the subject's gaze; the pupil may be as large as 1/3 the diameter of the eye or as small as 1/16. Size the pupil based on the age and emotionality of the subject; larger pupils indicate youth or excitement, while smaller pupils convey age or fear. Draw a border around the pupil to form the iris. Sketch the upper and lower lids of both eyes. Curve the eyelids around the eyeball; they may overlap the iris. Paint the upper eyelids in the tone of the subject's skin using the angled brush. Shadow around the edge of the eyeball where it rests in the socket. Highlight the eyelid where it peaks, near the iris. Color the lower eyelids using a darker color family; this will show the natural curve of the skull and highlight the cheekbones. Fill in the iris with the desired eye color. Add striation radiating from the pupil in a slightly darker hue. Apply a second layer of lines or flecks in colors lighter than the natural eye color. Continue until desired effect is achieved. Paint the pupil black. Add a thin black line around the iris. Paint the sclera, the area around the iris, white or red. Add small red veins or a pink tinge to indicate fatigue, age, or sickness. Brush a white highlight on the pupil/iris to indicate the presence of light. Use the same technique as you would with a sphere, showing the roundness of the eyeball. If using watercolor, guidelines will show through. Omit pencil lines if you want a clean product.